There is an increasing trend to bring agricultural practices indoors, this includes the use of vertical farming to increase production in smaller, urban spaces and allows farming to happen closer to where people consume the products, cutting down on the need for long-distance transportation and increasing product shelf life. With the increase of indoor agriculture comes an increase in energy use from these facilities, specifically in areas that are not ripe for year-round greenhouses. One area of the indoor agriculture industry that is booming and especially energy-intensive is the cultivation of legal cannabis. In many areas of the U.S., cannabis cannot be grown legally outdoors, and some municipalities even have restrictions on the use of greenhouses to cultivate cannabis. In recent years, states with legalized cannabis have seen a large increase in energy consumption, thus impacting energy efficiency goals and utility load. It is believed that indoor cannabis cultivation is just the first wave of increased demand for products grown indoors. With the increase of legalized cannabis throughout the Midwest, the energy efficiency community can learn some early lessons on how to tailor energy efficiency programs and policies to indoor agricultural facilities. Generally, lighting is the largest consumer of energy in a cannabis grow facility, but due to the plants' strict temperature and humidity needs, air conditioning, ventilation and dehumidification come in a close second. It has been shown that an indoor cannabis grow can spend upwards of one-third of their operating costs on energy expenses alone, significantly higher than a traditional commercial customer. 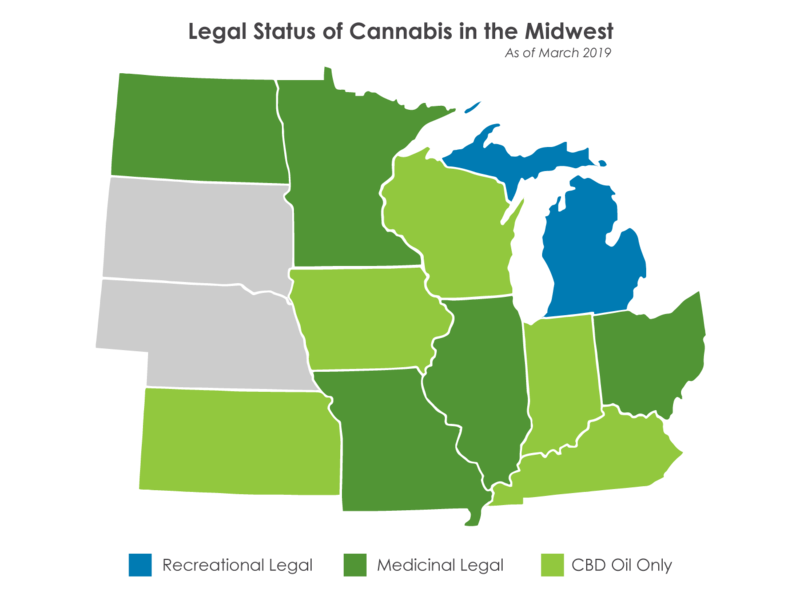 Legal cannabis is expanding in the Midwest, with 11 states in MEEA’s footprint allowing for the legalized use of some form of cannabis (either CBD oil, medicinal consumption, or recreational consumption), with Michigan passing a recreational bill in November 2018 and other Midwestern states close behind. Existing legalization of consumption in the Midwest means that there is already some energy impact, but not any corresponding cannabis-specific energy efficiency programs or incentives. There is an opportunity for the energy efficiency industry to start deploying programs and policies to decrease energy usage in this ever-growing industry. By collaborating in this nascent phase, efficiency stakeholders can help grow facilities meet their energy needs in a smart, sustainable way.